My Days in New York 1959–2018. The Eriskay Connection, 2018. 240 pp., 220 illustrations, 7¾x11". 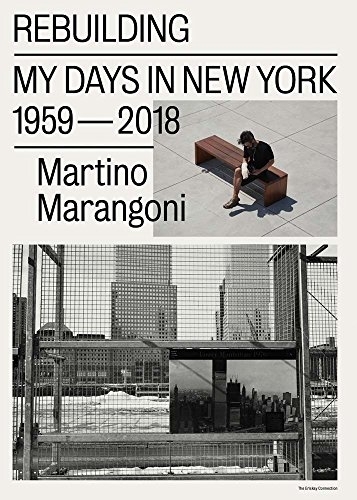 As the son of an Italian father and an American mother, Martino Marangoni (born 1950) regularly spent time in New York, where, impressed by the city's skyscrapers, he first learned to use a camera. From 1972 to 1975 he studied photography at Pratt Institute and became acquainted with the work of Robert Frank and Lee Friedlander, among others. His fascination with New York and his ties with friends and family brought him to the city almost every year: not only he was there when the Twin Towers were being built, but he was present when they were destroyed in 2001. Since that day he has returned to visit Ground Zero regularly, documenting the rebuilding of the area and the changing neighborhood. This new book collects images from his 60-year archive. Taken primarily in Lower Manhattan, and supplemented here with anecdotes, the photographs are an extraordinary testimony to this rapidly changing city and its street life.